Two chickens turkeys in the United States can continue to crow satisfied them, after the survivors of the butcher's knife. The savior is not just anyone. He is one of the most powerful man on earth: President Barack Obama. 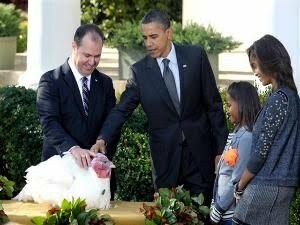 According to the daily pages of The New York Post, Obama held a "forgiveness" for the two male turkeys, that Apple and Cider at the White House on Wednesday local time, or a day ahead of Thanksgiving Day celebrations. They both would be guaranteed not to be slaughtered for the celebration of Thanksgiving delicacies, which this year took place Thursday, November 25, 2010. "This is one of the most important task for me as president," joked Obama, as quoted by CBS News television station, while stroking one of the turkey. In the event of forgiveness, Obama was accompanied by her daughters, Sasha and Malia. As a result, the turkey's tail could have stayed quietly in their cages at the Mount Vernon until the end of life. However, fellow Apple and Cider less fortunate. They remain a family meal along with Obama and most Americans. Thanksgiving is a day of celebration after the harvest. This is to remind that the U.S. was once an agricultural country. On 26 November 1941, U.S. President Franklin D. Roosevelt, signed legislation that formally set the fourth Thursday of each November as the Thanksgiving holiday.